Electric Tape Dispenser Fully Electronic Control System Extra heavy duty, self-oiling blade Larger water bottle capacity The Better Pack 555e Electric Tape Dispenser sets the standard of tape dispensers. For over 25 years Better Packages tape dispensers have been in continuous use in the packaging industry because of its innovative design, reliability, security, and low maintenance cost. 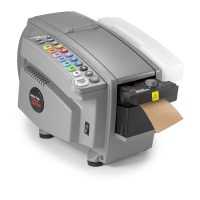 The Better Pack 555 has a fully Electronic Control System that has an innovative micro-processor control system which allows for easy and reliable interface with PC's, printers, weighing scales, shipping systems, and optical measuring devices. This is a professional grade product that can be used for a wide array of applications. The Better Pack 555e is the only electronic tape dispenser to pass UL requirements. The Better Pack 555e is innovatively designed and ruggedly constructed with a self-oiling blade that will ensure long lasting results. The large water capacity, along with the two brush system allows for less downtime and more productivity. Boatman Marking is confident that this Electronic Tape Dispenser will give the professional quality result that the packaging industry requires.